If you are missing all of your teeth, there are numerous options to consider, from several implants that attach to and stabilize your denture, all the way to a complete oral rehabilitation that results in a completely fixed restoration that resembles and functions just like your original teeth. One of our favorite and most rewarding procedures is helping patients just like you, who are unsatisfied with their current dentures. 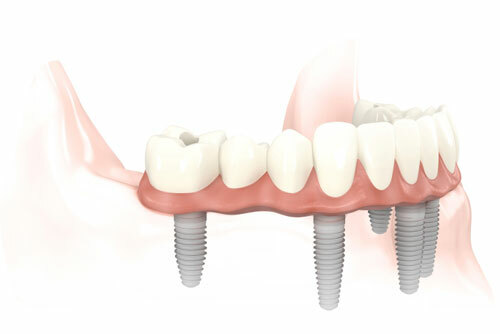 Through the use of dental implants we are able to provide secure support and comfort. Over the long term, the loss of bone that is associated with conventional dentures leads to resorption of the jawbone often resulting in a collapsed, unattractive smile. Our patients report that their dental implants are more esthetic and easier to maintain than their previous conventional dentures. Below are some brief animations that explore the different options for patients who are missing all of their teeth.